Great Western Coffee Shop > Journey by Journey > Heart of Wessex > First turbo to Weymouth? Re: First turbo to Weymouth? 20:48 Bristol Temple Meads to Weymouth due 23:07 will no longer call at Avoncliff, Thornford and Chetnole. If this service was operated by a non SDO turbo WHY tell lies to the travelling public, tell them the truth, THE TRAIN FOR THIS SERVICE IS NOT EQUIPPED WITH THE SPECIAL EQUIPMENT NEEDED TO STOP AT THESE STATIONS. I do wonder how often that service actually calls at Chetnole and Thornford even if it can - not exactly a busy time at that remote location and it only calls on request. NO, there isn't a fault as it was a non SDO turbo. It would have been a fault if it had been modified to a SDO turbo which had developed a fault which was not the case hence the capitalised TRUE reason suggested. Makes you ask the question if the Turbos aren't ready to provide the required service then why are the running on this line instead of a 150/158 that can do the job? Once again it's the passenger inconvenienced at the convenience of the rail operator. 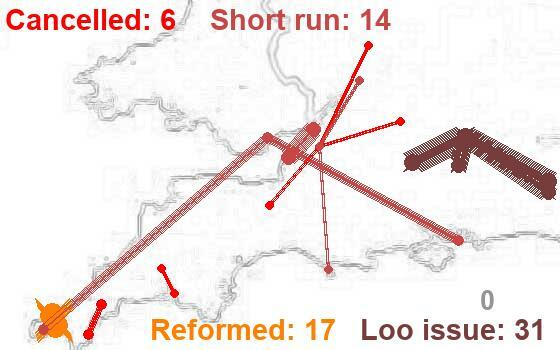 Because the 150/1s almost all headed north 10 day ago, and the remaining ones, and the 150/2s are having to run the diagrams they used to cover in Devon and west thereof. Stonehouse and Melksham - special arrangements and signage in place and working for services run by turbo trains which do not have SDO installed. Working well - turbo services are NOT missing out these stations, and the extra time taken at the stops is compensated by the running of 90 mph trains on 75 mph schedules. Avoncliff - where a turbo without SDO is scheduled to stop, the stop is missed. Alternative arrangements - doubling back and an extra stop on another service on the line (trains run every 30 minutes) are available. And many services though there are not (yet) turbo. Dilton Marsh - as Avoncliff, but a bit easier for arrivals as the stop's only made on request so train crew will know and personally be able to advise. Chetnole and Thornford - GWR are concentrating their precious few SDO fitted Turbos on this line to minimise the need for skips. Passenger numbers at these two stations are low (and I suspect seasonal), the stops are only "on request", and I suspect that the inconvenience when a skip is made will be to very few people. Mind you - no other trains typically close by to pick up the stops, so this is a low number but high inconvenience disruption. The daily issue of the 05:17 Gloucester to Southampton terminating and restarting at Westbury makes for a noticeable number of unhappy people who are used to settling down at Swindon / Chippenham for the ride to Warminster / Salisbury and the last thing they want in the middle of their journey is to be turfed out of a nice warm seat and train for exercise via the subway and a cold wait for the arrival of the ongoing service! Not sure if this has been posted elsewhere but I think its worth noting that a more detailed explanation has been posted on JourneyCheck entries with missed stops on Turbos. I’m all for more detailed explanations, even if they are a bit late. 14:38 Westbury to Bristol Parkway due 15:44 will no longer call at Avoncliff. To increase capacity on our Weymouth and Southampton services we are introducing 3 coach Turbo trains. 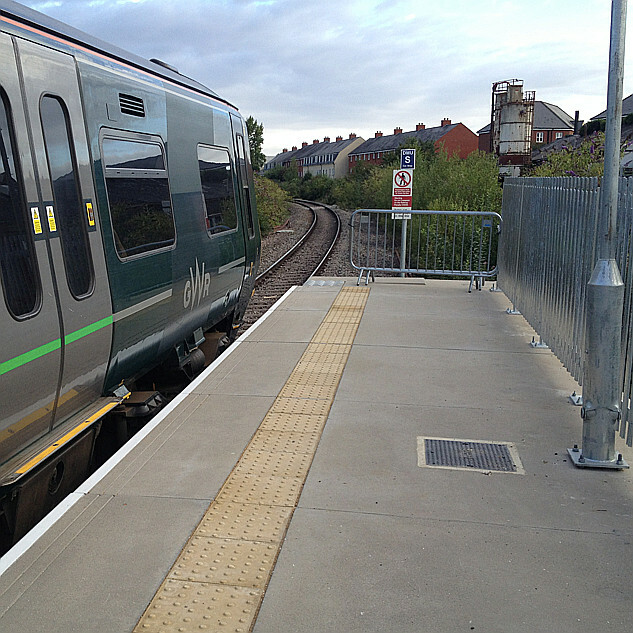 Turbo trains require the fitting of local door controls to allow them to stop at stations with very short platforms. A Turbo train not fitted with these controls cannot call at Avoncliff, Dilton Marsh, Chetnole or Thornford. Unfortunately it has taken longer than expected to fit the controls and the Turbo train being used on this service today has yet to be fitted. If you at one of the stations the train is unable to call at please use the help point or contact National Rail Enquiries on 03457 48 49 50 and we will arrange for an additional stop on another train, or alternative road transport if another train cannot be stopped within a reasonable time. We would like to apologise for the difficulties we know this has caused to your journeys recently. I have noticed (or not noticed actually) that a regular passenger who usually gets off at Thornford has not been seen on the train over the last few weeks, I do hope that he hasn't given up on train travel due to this "Train Fault". 06:49 Worcester Shrub Hill to Weymouth due 11:03 will no longer call at Avoncliff, Thornford and Chetnole. 11:10 Weymouth to Gloucester due 14:31 will no longer call at Chetnole, Thornford and Avoncliff. I made my first Turbo 166 journey (in First Group blue/pink livery) from Frome to Weymouth yesterday. On joining I realised I could travel in one of the (former?) First Class seats. The front section in this case was still labelled as First Class and had proper 2+2 table seats. The seats were trimmed in First blue with pink! and half had anti-macassers. Only one other person joined us, the rest being deterred by the signs. A comfortable journey but the air-conditioning was too fierce for "Spring." I did not inspect the rear of the train but are any first class designated areas to remain in the 166s once the trains are refurbished?? My return was on the 20.21 WEY and as usual this was a 3 car 158 finishing its day from the Brighton-Great Malvern circuit. We were delayed on departure awaiting the driver (to become a passenger) from the inbound service arriving slightly late around 20.16. According to RTT this unit now needs to be placed after arrival in Jersey Siding for the night which was not previous practice. Later I pondered that the likely reason for this is because Plat 1 at WEY only holds 5 cars. So once we have a fully Turbo service, two units cannot be stabled there overnight. Naturally, the likely knock on is that any (shorter) delay in the 20.10 arrival will mean a late departure of the 20.21. A longer delay will mean the driver returns to WSB? by road? This is "positive progress" and great customer care. Since the 0845 Parkway is the return of the 0533 Weymouth that adds another. The 20.21 WEY departure is formed from the stock of the 19.10 arrival from Great Malvern. I use this train frequently and (at least until recently?) has involved various shunting movements to organise things for the next morning. The use of Turbos now seems to complicate this even more. The 20.21 is the final leg of a diagram that starts in Portsmouth (to Brighton) and is normally a 3 car 158 (on most weekdays?). The use of a 158 is perhaps likely to continue until, either the diagrams are revised (especially to cover Brighton services) or all the 158s disappear West. 08:45 from Parkway fortunately swapped out at Bristol for a 2-car class 158 so Avoncliff granted an additional call on that one in lieu of the Weymouth train. Thornford and Chetnole have the indignity of two successive services in each direction failing to call. That is a sizeable gap in the timetable.